itty bitty Hellboy Mini-Bust Figure by Skelton Crew Studio | Nerd Much? The juxtaposition created with the itty bitty version of Hellboy always gets a chuckle from us here at Nerd Much? It’s like, this evil-looking anti-hero somehow can look damn cute in mini form — sort of like the Hellboy version of Teen Titans Go. Clearly, the creators at Skelton Crew Studio are feeling it too, as they’ve just debuted a the damn cutest itty bitty Hellboy Mini-Bust we’ve seen yet. 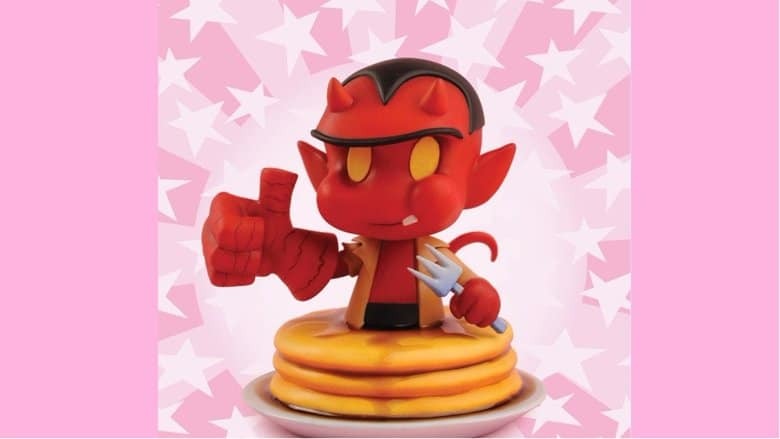 This little guy stands 3.75-inches tall (about the height of a Funko Pop), and he’s shown giving his signature smirk and thumbs up while eating a big stack of syrupy pancakes. It’s based on the art of Art Baltazar’s from the itty bitty Hellboy comic book series. This collectible will have an MSRP of $84, and it’ll ship some point in Q3 2018. If you order it before January 31, you’ll get an early bird special and will pay $72.00, plus you’ll get a free Limited Edition, hand-numbered print of Art Baltazar’s original control art for the bust, signed by the artist, himself. If you’re unfamiliar with Skelton Crew Studio, well, so were we until this arrived in our inbox. However, it appears as though the company has some stellar creations revolving around some Image and Dark Horse comics, including Revival, Huck, and some B.P.R.D. stuff. We hope to see more from them in the future, and we’ll definitely be keeping an eye on them for now. For more ridiculously cool stuff to blow your rent money on, stay tuned to Nerdmuch.com for daily finds. You can also follow us on Instagram and other social channels (links at the top right of our site), as we take snaps of cool things that arrive at our doorstep daily.